You have waited a trying and patient forty weeks to meet your precious little baby, and now you never want to put them down. Going home, you are exhausted and know you and baby need a good rest. Many mothers try to put their baby in the crib to get some shut-eye, only to be woken every 20 minutes. Good news, co-sleeping allows you to sleep for longer stretches, while still enjoying that new baby smell right next to you. In many countries around the world, it is natural and acceptable for mothers to sleep with their babies. This tradition lasts well into the teenage years in some cultures. 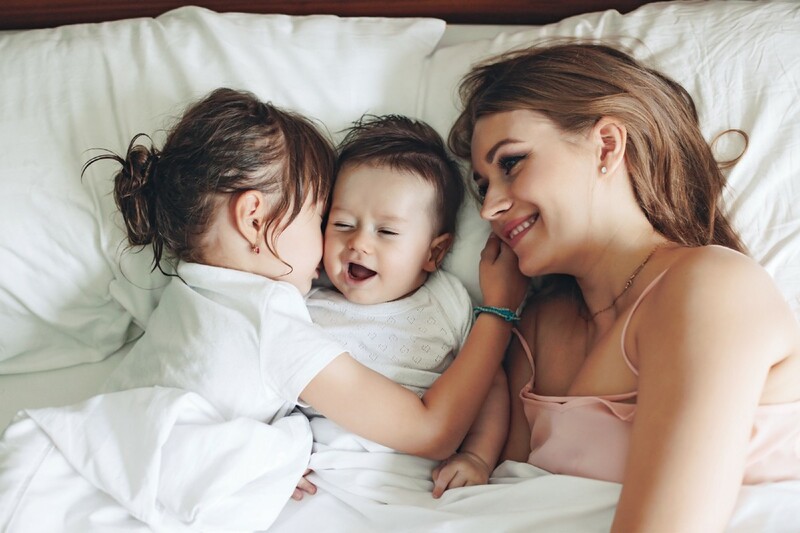 The United States has some of the strongest opposition to co-sleeping despite high numbers of mothers utilizing this practice successfully for at least some of infancy. Naysayers try to say that you should never co-sleep because it is dangerous for your baby, but research has something different to report. To begin, what exactly is co-sleeping? Typically, it is defined as when your baby is within arm’s reach of you while sleeping. This could be by either the baby sleeping in the bed with you or having the baby close by in an attached sleep area adjacent your bed. When your baby is next to you while sleeping they are given constant reminders that they are safe. This is done by smelling you, feeling the rhythms of your body like when they were in the womb, and feeling the warmth of your contact. Having your baby close gives you the advantage of hearing if your baby is compromised in some way, such as choking or breathing difficulties. Crying can be hard on mother and baby, which releases a lot of stress hormones. Co-sleeping babies tend to cry less, according to Dr. Norholt, which saves you both the stress. Dropping temperatures in a baby can weaken their immunity, and use energy that would be better spent on their rapidly developing body and minds. Sleeping next to mommy gives baby an added level of warmth from your body heat, in return allowing them to use all their energy to fight off germs and sprout up overnight it seems. Breastfeeding babies need to feed regularly to keep the supply up. When the baby is in the bed with you they tend to feed for longer periods and on more of a schedule. The American Academy of Pediatrics reports that there is a higher risk of SIDS when the baby is in another room, compared to a co-sleeping scenario. There are some guidelines you can follow to co-sleep in a safe way if you want to give this timeless and beneficial method a try. Just as in a crib, it has been found to be safest for the baby to sleep on their back. Babies do well sleeping on their bellies, but stay in a lighter phase of sleep on their backs which is good for sleep apnea. Never let a baby sleep in your bed of toxic substances are involved, such as cigarettes, alcohol, mold, or illegal drugs. Be careful that there are no areas your baby can fall into on your bed. A space between your headboard and mattress or guardrails would be examples of this. Remove excessive pillows and covers that could cause suffocation risks. Older siblings should also be removed from the bed before an infant sleeps in it. Once you have a safe environment for you and baby, bask in the comfort that having your baby close and safe brings. Giving your baby the feeling of having their needs met continuously as an infant gives them lifelong security and increased independence when they are older studies show. Cuddle your little one close tonight, and give you and your baby the best night’s sleep you have had in a while as a new momma. Please let us know in the comments section if you are a co-sleeper, and what benefits you have enjoyed.